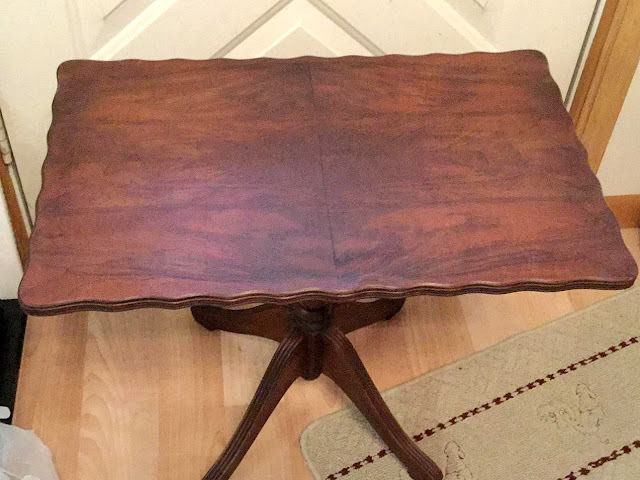 I purchased this small two piece serving table last summer at a garage sale. 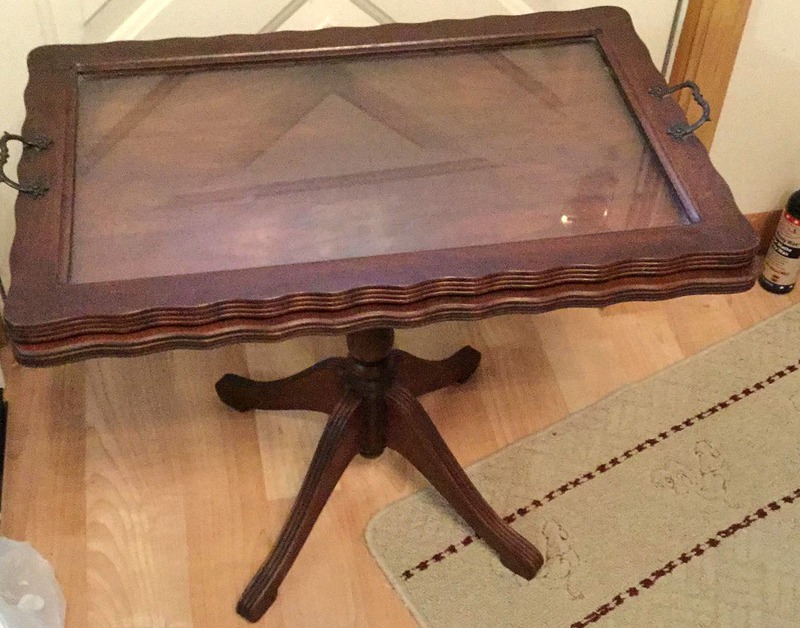 The top was a framed glass tray that just rested on the table with small rubber feet. It probably seems crazy to some, but I split up the two pieces for two separate projects. I think the set is much too formal for today's casual style, and open concept living. 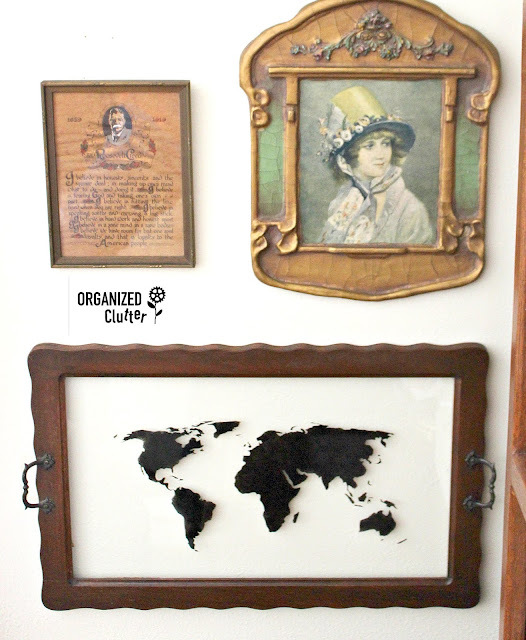 My plan for the framed glass serving tray involved the world map stencil in this STENCIL PACKAGE from Joann Fabrics. I don't think this stencil pack is available in stores, but usually you can get a coupon or at least free shipping every week. First I cleaned the tray's glass with Windex. 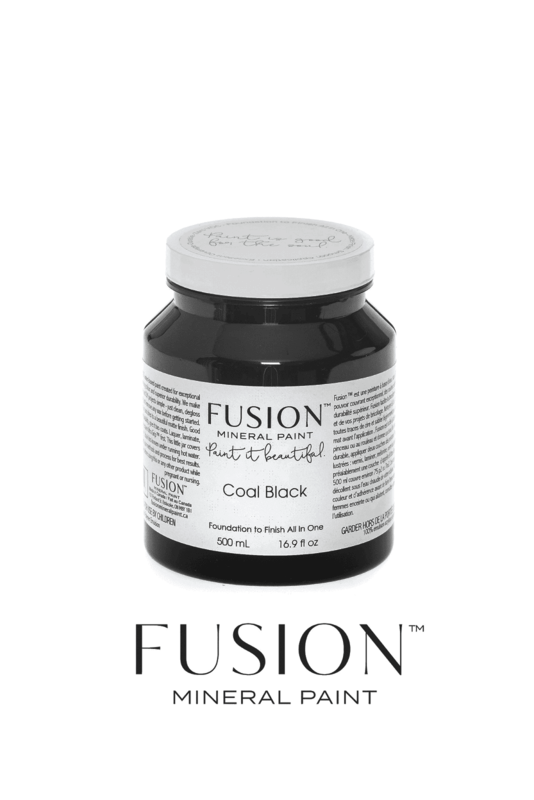 I chose Fusion Mineral Paint in Coal Black to stencil the map. 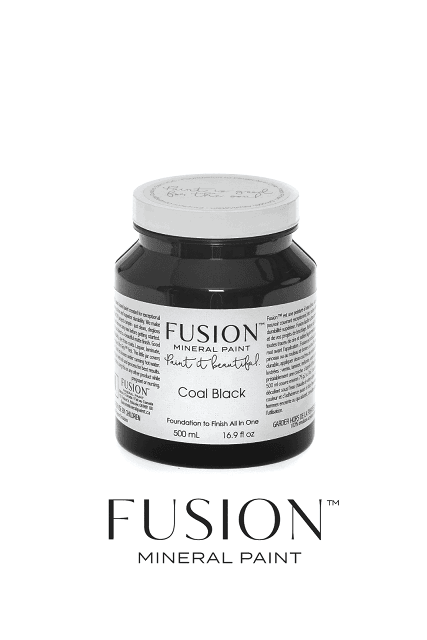 I have found that Fusion Mineral Paint works well for stenciling on glass. I used a medium-sized stencil brush (with bristles), and I dabbed the brush several times on a paper plate and swirled it before stenciling. 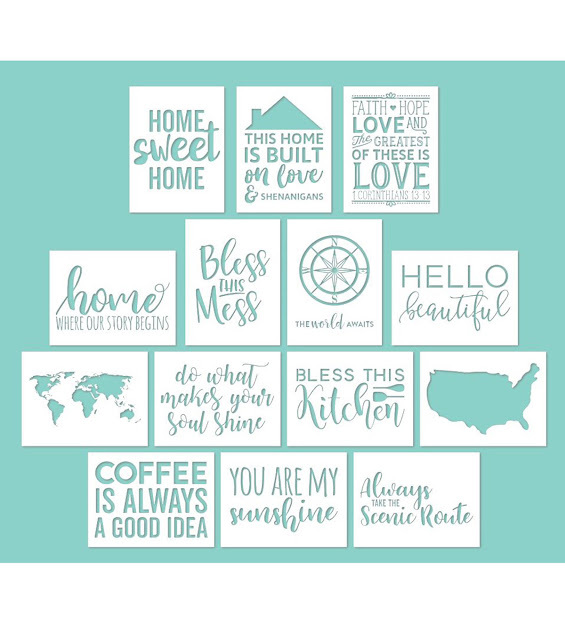 I needed three coats of stenciling to get the look I wanted. Coat one was way too transparent. In fact, it seems like the brush is taking off as much paint as putting down, when pouncing. The second coat is better, but I found the third coat was the charm. If any spots are still too transparent, re-align your stencil and dab a bit more. A Small Saw Tooth Picture Hanger was added to the back top for hanging. Instead of using the nails supplied with the sawtooth, tiny screws were used for extra strength. You may need to make the sawtooth holes a little bigger with the drill to fit your screws. The frame on this tray AND its style, really coordinates well with my dining table. For today, I'm not sharing the whole dining area, just this wall vignette on one side of my dining table. 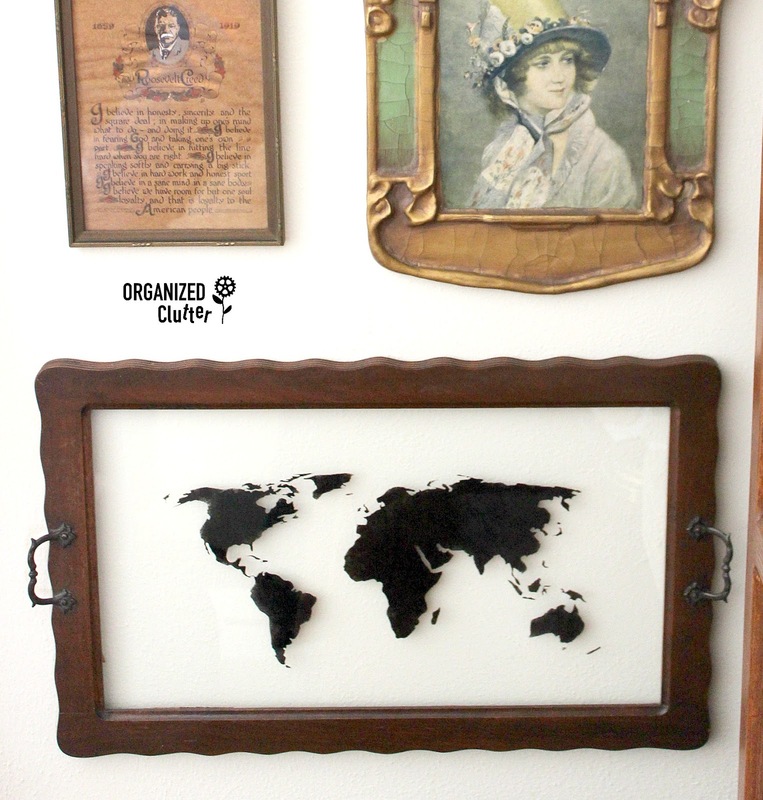 I think my framed glass world map goes well with the vintage gold lady portrait, and my framed Teddy Roosevelt Creed. 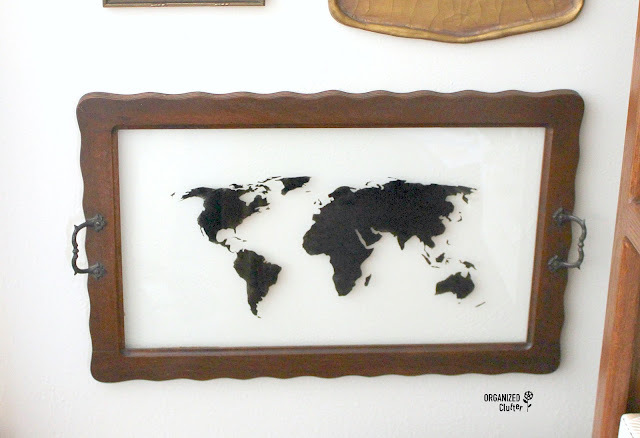 A world map stenciled on an old window would be fun too! The little table makeover will be coming this week! Simply adorable! I love ma-s or anything with the world maps on it. love that you left the handles on there also. You are right about being formal....this era is just so different and we just don’t use things like that any longer. People are forever trying to give me vintage dressers and vanities and tables..whatever. I jist don’t have the time nor the room right now and I simply can’t figure out what to do with some things so I have to say no. Can’t wait to see the table now.